Concrete vs Asphalt: Where do you run? "The differences in hardness between asphalt pavements and concrete pavements have been assessed on sections of intercity highway in steady highway speed conditions. In most temperature conditions, there were only small differences between the two pavement types. However, in warm weather, reductions of up to 8% in fuel consumption were measured for concrete versus asphalt surfaces. The effect of the pavement difference at the lower speeds typical of urban driving has not been measured but is probably more pronounced, as urban asphalt pavement has more time to deform." One often overlooked advantage to interval training is that you get to practice your warm-up. Much like a 5K race, intervals take your body from zero to race pace in nothing flat, and that takes the body a little getting used to. When you start fast, blood is immediately shunted to the legs, and the heart responds by beating faster. Warming up prior to high intensity leaves the leg muscles warmer and pumped full of blood ready to run. It makes perfect sense to me that after a proper warm-up, the body doesn't have to work as hard getting through this initial start-up process, thus delaying oxygen debt and making running a bit easier. A good warm-up routine involves 5-15 minutes of easy jogging, followed by 5 minutes of light stretching and perhaps a few range of motion drills. I like to go through a set of 10 rapid back kicks, lifting my heels to kick my gluts. Before a race, I always do 4-6 race pace strides for about 50 meters, allowing at least 5 minutes of recovery before the gun goes off. Before intervals, I do the strides just 2-3 minutes before the starting the first one. Pre- interval warm-ups are a perfect time to practice and get comfortable with your own personal warm-up routine. If you are new to intervals, you will also experience some pre-workout jitters. This is completely normal and to your advantage. Intervals not only prepare you physically to run hard, they also prepare you mentally! If you are a runner and not doing interval training at least part of your racing season, you are not even close to performing to your potential. Here are some basic guidelines and recommendations to get you underway to faster times through intervals! training, 8 miles per week minimum, low to moderate intensity. 3. Beginners should do no more than one interval session per week. weekend race or long run. 4. Shoes- I like to run intervals in the shoes that I race in. under 2:15. Be conservative at first- 2:05-2:10 range. 7. Your recovery as a beginner should be 2 minutes. miler might apply to interval training using all 4 options. 10. I like to recycle back to one specific workout to test fitness. (your ability to maintain a faster pace)! Regular interval training leaves you with any number of options. 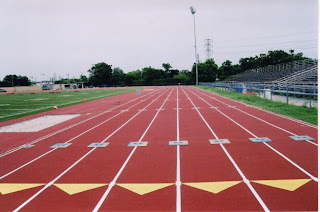 For example, many runners like running ladder workouts. 200 meter, 400 meter, 600 meter, 800 meter, than back down, rather than running the same distance all the way through each workout. Another word of advice- pick out a key race to peak for and schedule your intervals accordingly. After your big race, back off a bit before rebuilding another progression. Keep me posted! (c) Dave Elger All rights reserved. (Ivanhoe Newswire) -- Hitting the gym may help seniors find the fountain of youth. The fact that their 'genetic fingerprints' so dramatically reversed course gives credence to the value of exercise, not only as a means of improving health, but of reversing the aging process itself, which is an additional incentive to exercise as you get older. Check out The Road Runner Information Center Annual Marthon Report for 2006. Can you guess the 5 largest marathons in the U.S. How about in the world? According to the report, 410,000 participants finished a U.S. marathon in 2006. There is no question that the running shoes today are far superior to anything we used back in the early 1970s. In those days there wasn’t much difference between brands in terms of shock absorption, stability, or motion control. Nike was one of the first to revolutionize the running shoe industry when it came out with an innovation called the “waffle” outersole developed by Oregon coach Bill Bowerman. Today, shoes are designed with specialized features to meet your individual needs as a runner. Whether you have a flat arch, overpronate, or weigh 200 pounds, there is a shoe out there somewhere designed to meet your needs. I don’t know for sure if these advances in shoe technology have reduced the incidence of running injuries, but there is no question that some of the features can benefit a runner with an existing problem. For example, an overpronator prone to plantar fascitis or shin pain will find that a stability shoe helps. At least one authority, however, thinks that expensive running shoes are overrated and in fact may ultimately cause running injuries in people with normally functioning feet. Michael Yessis, Ph.D. in his book, Explosive Running, explains that running shoes with their extra heel cushioning allow runners to strike the ground with their heel first rather than at the midfoot, increasing the force of impact and pronation. He also believes that the foot’s supporting structures (bones, ligaments, tendons, and muscles) eventually weaken as the shoes do their job of protecting the foot. Dr. Yessis claims that barefoot running may be the answer. Without shoes, runners are forced to land closer to the arch on the mid-foot rather than the heel, dramatically reducing impact. Without the support that a running shoe provides, barefoot running also strengthens the foot by allowing it to function the way it’s supposed to. Common sense tells you not to start leaving your shoes at home every time you head out for a run. Barefoot running must be introduced gradually. Start by finding a smooth stretch of grass to jog on, maybe 4 or 5 minutes twice a week. Jogging without shoes, you’ll notice immediately what Dr. Yessis is talking about when he says you will not want to land heel first. Keep the pace very slow and relaxing. Over time I recommend adding a couple of minutes a week as your feet become stronger. Focus on how your feet land while running barefoot, then practice carrying that technique over to the roads with shoes on. Before long you’ll notice your foot plant changing as you get away from striking heel first. Barefoot running is not recommended as a cure for heel or other foot pain- you’re likely to make the problem worse. However, a couple of 20 minute barefoot jogs a week may be a good preventive measure for a healthy runner looking for a different way to improve. In each and every year in recent memory the tiny nation of Kenya produces more sub 2hr 20 minute marathoners than any other nation. According to IAAF, in 2005 an amazing 63 Kenyans broke 2 hr 12! Besides their intense training schedules, a not so obvious difference is that Kenyans typically spend their entire childhood running barefoot. Their feet are strong and they learn to run the correct way at a very young age. Coincidence? Why You Should Pay Attention to When You Eat and Drink! “What we found in our studies, is that you can recover more effectively, work out harder more frequently, increase muscle mass and enhance the physical adaptations that are happening when you exercise just by minding what supplements you use and when you supplement. - Dr. John Ivy, co-author of "Nutrient Timing" and "The Performance Zone". Read more here! Intervals produce significantly better results than tempo runs, at least according to a study carried out by Peter Snell, former 3-time Olympic gold medalist and 800 meter world record holder. As summarized by Owen Anderson, Snell trained 2 groups of athletes, one with tempo runs and the other with 200 and 400 meter intervals. Each group performed their prescribed workouts two times per week. After 10 weeks, the interval group improved their 800 meter times by an average of 11.2 seconds and their 10K by 2.1 minutes! The tempo trained group also improved, but only by about half as much. cells to get better at clearing lactate from the blood." Read the full article found at planetultramarathon. I wrote about using longer intervals to work on speed, but conversely you can also try using shorter intervals to work on strength! When I first moved to Utah, I found it near impossible to run 8-10 x 800s like I used to do in Okinawa, so decided to give 400s a try. After a couple of workouts I found that I could use them as a strength workout by keeping the pace moderate, shortening the recovery to only 30 seconds, and increasing the number. I actually did one 20 x 400 workout before Boston. It sounds hard and it was, but no more difficult than the 10 x 800 workouts I was managing in Okinawa. The key, of course, is not getting carried away with pace on the early ones. They take some getting used to but offer a nice break from the usual long for strength formula, especially at altitude! Natural cold remedies have been around for centuries. According to the The Berkley Wellness Newsletter, plants that have not been used at some time in hope of combating the common cold are indeed rare. The Chinese have been treating illnesses with an assortment of herbal remedy concoctions for centuries. Does anything work? While there is still no proven cure for the common cold, several natural remedies have now been studied and show some promise for reducing the severity of symptoms and shortening the length of your illness. to 1,000 mg per hour for several hours at the first sign of cold symptoms. Since that time, Vitamin C and the prevention of colds and reduction of symptoms has been thoroughly investigated. Other than a hint that colds are slightly less severe, the research on supplementation with varying amounts of Vitamin C does not support original claims. Once and for all, there is no overwhelming evidence that Vitamin C can prevent or cure colds as was once widely believed. Andrographis: From plants grown in India and China, some studies have confirmed that 60 mg per day of andrographis can stimulate the production of infection fighting white blood cells and reduce the severity of cold symptoms. Garlic: Garlic has been used for thousands of years and is well known for its immune system boosting ability and antiviral properties. There is some evidence that garlic supplementation with allicin offers some level of protection and reduction in the severity of colds. Allicin is a bacteria and fungus fighting compound produced when garlic is crushed or chopped. It is not very stable so degrades quickly when cooked. Zinc Lozenges: Some studies have shown that zinc glutonate or zinc acetate lozenges can reduce the average duration of cold symptoms by as much as 50%, while others found no benefit. Zinc is an essential mineral found naturally in foods such as oysters, liver, meat, eggs, and whole grains. It is thought that zinc may interfere with reproduction of the cold virus or keeps it from entering cells. The effectiveness of zinc supplementation may be determined by the potential for zinc absorption, or ZIA, and bioavailability. Certain high fiber foods can interfere with the absorption of zinc. Echinacea: Echinacea was first used by Native Americans for things like insect and snake bites. Today, this herb is a popular remedy for fighting colds and flu symptoms, especially in Germany. So far, the studies on this herb offer mixed results at best, and most clinical researchers remain unconvinced that it works. Propolis: Propolis is a substance used by bees to construct their hives that help block out bacteria and viruses. It contains amino acids, vitamins, and minerals with antioxidant properties. A small number of studies have found that propolis extract can reduce severity of cold symptoms in humans. Hydrogen peroxide: Dr. Joseph Mercola, author of Total Health Program, recommends a few drops of 3% hydrogen peroxide in each ear within 12-14 hours of the onset of cold or flu symptoms. This one was introduced in Germany in the 1930s, and while the internet is full of testimonials, I could not find any supporting clinical studies. One problem associated with using natural remedies may be related to purity. ConsumerLab, an independent company that routinely tests over the counter products not evaluated by the Food and Drug Administration, has reported significant variance from the labels in many of these products including echinacea, zinc, and garlic. Natural remedies derived from plants also have the potential to be contaminated. Remember, antibiotics will not work against a virus. If you decide on a natural remedy, the sooner you start taking it after the onset of symptoms, the more likely it is going to work. The fastest runner usually does not win a distance race. It's the runner who slows down the least! Interval training, as most everybody knows, is a great way to improve your stamina and speed for all distances. The theory is that you can perform more work with rest intervals than you can through continuous running. Higher intensity, shorter duration work stresses the muscle fibers and stimulates adaptations you cannot achieve through just distance work. You'll also improve your biomechanics and adapt neurologically so fast running will not be foreign to your leg muscles. Finally, you'll give that anaerobic threshold and VO2 a little added boost. The beauty of running intervals is variety. You can make them progressively harder by increasing the number, decreasing the length of recovery, increasing the length of each interval, or finally running them faster. Another plus is you can be finished up with a great quality workout in as little as 30 minutes. The standard coaching advice is to run shorter intervals (400 meters or less) to work on speed, and longer intervals (800-1,600 meters)to work on strength. It's a good idea and it works, but sometimes it pays to try something different. Once in a while I like to use a longer interval to work on speed! Normally, the rest period between each repeat interval is approximately the same. If you run 400s in 90 sec., you are recovered enough to go again in another 90 seconds. If you find yourself in a rut following this routine, here is the idea. Run 800 meter repeats at your normal 400 meter pace, then double your rest period. What I like about this approach is after the 2nd or 3rd one the second half of each interval comes close to 5K race simulation. At least that what it feels like to me. Another recommendation is to try and run them progressively faster, so you are pretty much maxed out during that last 400. This is the kind of workout that you only want to do once a week, and probably not more than 3 or 4 times in a row before going back to your normal stuff. I would be surprised if your workouts or race times don't improve! C) 2007 Dave Elger all rights reserved. Are you blaming your weight problem on a slow metabolism? Read Metabolic Myths by Rachel Johnson, Ph.D., M.P.H., R.D. Find out if your portion sizes are too big by taking this portion distortion quiz from the National Institute of Health. Looking for an exercise you can do at home to supplement your running? Here is something I stumbled upon called Hindu Squats that I believe may help. Done on a regular basis, Hindu Squats will improve muscular endurance in the gluts, quads, calf, and hamstrings. Start with 20-30, and then work up to 2 sets of 50. According to Combat Conditioning guru Matt Furey, “when you can do 500 straight Hindu Squats, you’re on your way to greatness.” Anybody that can do 500 is also getting a great cardio workout. Hindu Squats differ from lunges- knees end up in front of your feet and heels are lifted. I would proceed with caution when performing Hindu Squats if you have any kind of knee pain- don’t go lower than a 90 degree bend at the knees, at least intially. As with any exercise, stop at the first sign that pain becomes worse. Watch this great clip from yahoo.com that illustrates proper technique. Looking to break out of an L.S.D. slump? Mihaly Igloi was a Hungarian distance coach who had great success using a large volume of short intervals usually ranging from 100 to 400 meters. He coached Americans Bob Schul (gold medalist in the 5,000 in 1964), Jim Grelle (former American record holder for the mile and 2 mile), and Jim Beatty (first to break 4 minute mile indoors) among others. While he incorporated varied pace and stride length in his workouts, from what I’ve read easy days were few and far between. His athletes did 13 workouts a week, and just about every one included short intervals. If you visit letsrun.com, you’ll find a facinating discussion of Igloi’s methods, including input from a few runners who actually trained under him. Another source worth reading is The Long Run by Bob Schul. For the last 2-3 months I've added more short intervals- 8-10 x 400s twice a week, and there is no doubt they really are helping. I vary the recovery and intensity so I am not doing precisely the same workout each time. As soon as I feel ready I will move up to 800s, and now that I am comitted to entering a 3 race trail series, I will also add some uphill intervals. If you are doing short intervals for the first time, take my advice and ease in with just 6. No sense risking injury. People from all parts of the world have heard of small town of Framingham, Massachusetts, population 65,000. I recently completed the 111th running of the Boston Marathon and passed through on my way to Boston from Hopkinton. The 10-kilometer checkpoint on the fabled Boston Marathon course is located in Framingham. But that’s hardly not the only reason this town is so well known. According to the American Heart Association, with the exception of 1918, cardiovascular disease has been the leading cause of death in the United States since 1900. Prior to 1940 coronary artery disease was thought to be just a part of the normal aging process that couldn’t be slowed or affected by lifestyle. In those days there was no established relationship between heart disease and cholesterol, diet, smoking, or obesity. Doctors believed that blood pressure was something that was supposed to increase with age. Although people knew about heart disease in 1940, there was certainly no warning that it would reach epidemic proportions by the late 1960s. Recognizing that heart disease was becoming a major public health concern, in 1948 the National Health Institute went to the town of Framingham and recruited 5,209 healthy residents between the ages of 30 and 62 years to participate in a study. The idea was to monitor the health of these people over the years, see who develops heart disease, and then try to find out why. Every 2 years the Framingham volunteers were given extensive physical exams, lab work ups, and lifestyle interviews. In 1971, a second generation of 5,124 of the original participants’ adult children and spouses were added to the database. Now, more 50 years later, the Framingham Heart Study is one of the most recognized in the history of modern medicine. It was through the follow-up work done on the people from Framingham that researchers were able to positively identify the major cardiovascular risk factors that we know so well today such as high blood pressure, high blood cholesterol, smoking, obesity, diabetes, and physical inactivity. Using the data collected from Framingham, scientists and doctors have published more than 1,000 scientific articles in medical journals and still continue to do so. New potential risk factors have been discovered and are currently being studied such as the amino acid homocysteine and a lipoprotein called Lp(a). Viral or bacterial infections are being investigated as a potential explanation for early damage to blood vessel walls. In addition to heart disease, the Framingham data is also being used to study other age-related problems such as stroke, dementia, osteoporosis, arthritis, diabetes, eye disease, and cancer. Armed with DNA from 2 generations of Framingham residents, genetic links to certain diseases are now being explored. The original Framingham Heart Study paved the way for the prevention revolution in medicine. So next time your doctor tells you to give up smoking, eat a low fat diet, lose weight, or get some exercise, just remember the residents of Framingham who have served as guinea pigs since 1948 to prove that you can do something about your own health. (C) copyright Dave Elger 2007 All rights reserved. The Wasatch Altitude Training Cente r is scheduled to open this fall in Mountain Green Utah . Check out the website here for complete details! Check out the GOAL Foundation, "...a group of community leaders, business owners, former Olympic planners and volunteers all dedicated to attracting, supporting, and promoting sporting events to those in and around Northern Utah." I went to their volunteer party last Saturday. Ogden is fortunate to have such a motivated group among their midst. The Ogden Marathon, the XTERRA Mountain Championships, and Tour of Utah are examples of first class events the Foundation supports.